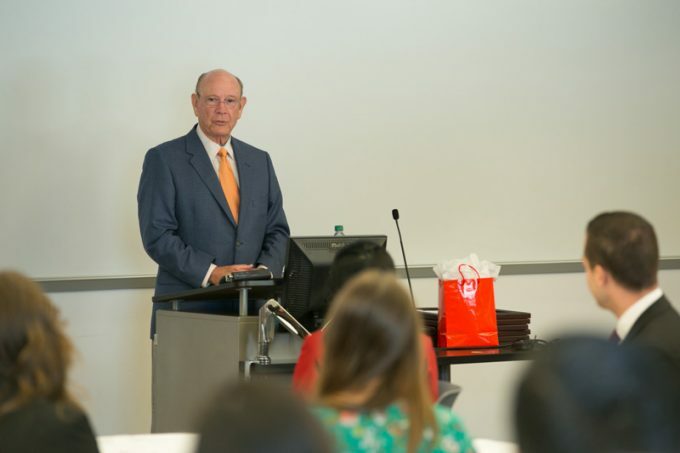 Amegy Bank Founder Walter Johnson spoke to Bauer College student leaders about determination and hard work during an award ceremony in April. The secret to a successful life isn’t much of a secret, according to Amegy Bank founder Walter Johnson. Hard work, determination and relationships are all important, he told Bauer College student leaders recognized during an awards ceremony in April. As the event’s keynote speaker, Johnson shared his personal story of humble beginnings where it didn’t seem that college was in the cards to graduating from Texas Christian University in just three years before starting a career in sales and eventually founding one of Houston’s largest banks. Growing up, Johnson said, he watched his father hold several jobs at a time and work with his hands, helping him take apart cars and put them back together, establishing an appreciation for hard work. After graduating from college, Johnson worked as a typewriter salesman before beginning a career in banking, serving as president and CEO of Allied Bank, which he helped to build from $100 million to $5 billion in assets before it was purchased by First Interstate, which become Wells Fargo. Over the course of his career, Johnson said, he changed paths a few times before finding his passion. More than 20 years ago, Johnson founded Amegy Bank alongside his wife Yvonne after personally raising $21.5 million to capitalize the bank. He took the company public in 1997 and ultimately merged it with Zions Bancorporation in 2006, netting $1.7 billion for shareholders. Today, Amegy has more than $12 billion in assets, 2,000 employees, and more than 85 branches in Houston, Dallas and San Antonio. Johnson said he owes much of his success to the team around him, which includes Amegy President Steve Stephens, a member of the Bauer College Board. Success is better when it’s shared, he added, noting the importance of service and community engagement. Johnson has chaired many fundraising campaigns for Houston organizations, including Memorial Hermann Healthcare System, Star of Hope and the Boy Scouts of America, among others. Johnson left the students with one last piece of advice — never quit learning.